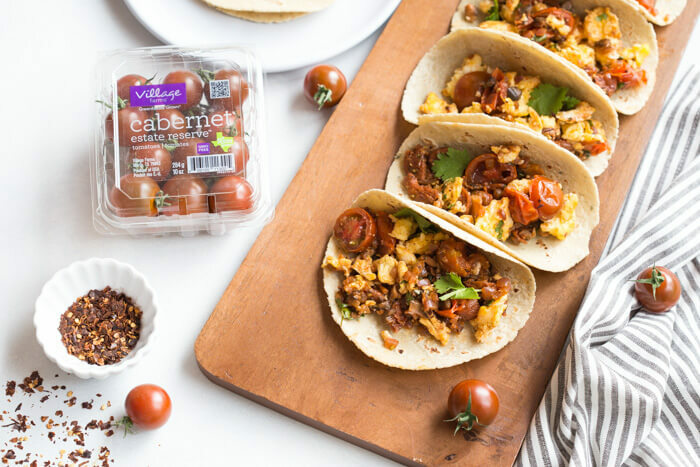 This recipe post for Skillet Breakfast Tacos is sponsored by Village Farms. Are you ready for some more breakfast eatin’!? 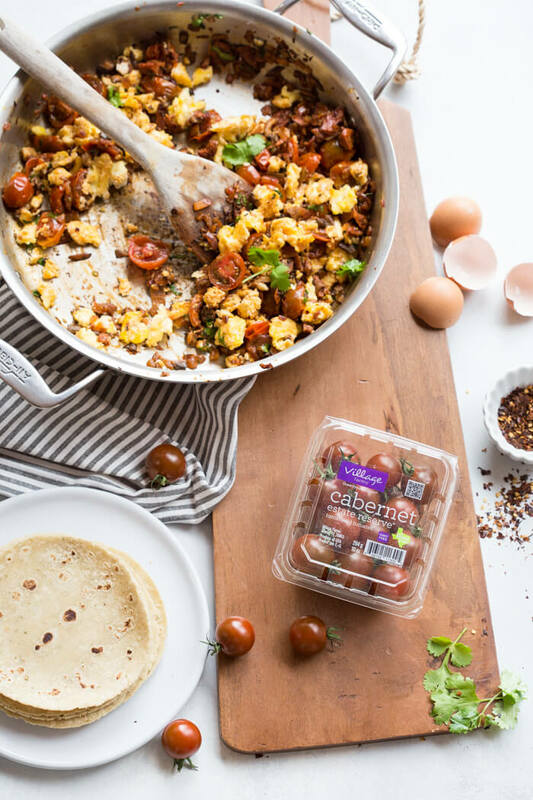 Get excited because these Skillet Breakfast Tacos with Chorizo and Village Farms Cabernet Estate Reserve® Tomatoes are da bomb dot com. Like literally flavor explosion in every bite. This recipe is one of those can’t stop, won’t stop type of breakfast recipes. We are Mexican food all day err day type of people. 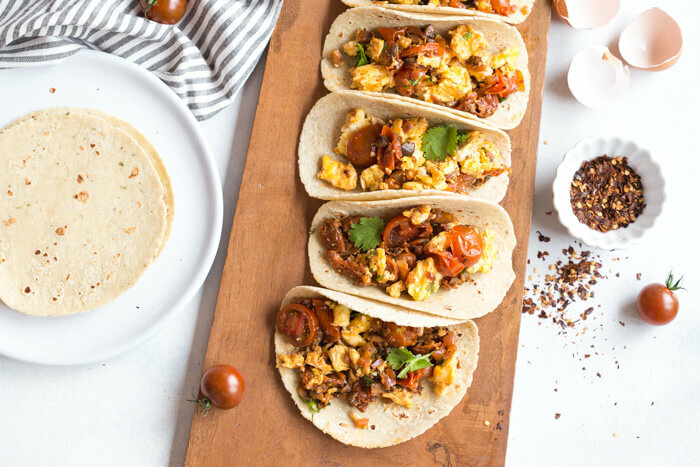 It doesn’t have to be Tuesday for taco night (or breakfast) at our house! You know what I mean? Please tell me you are a taco loving person too. 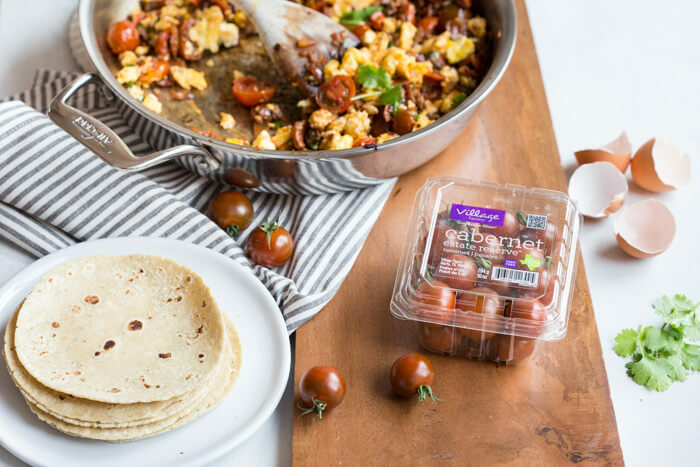 Because SKILLET BREAKFAST TACOS with Chorizo and Tomatoes, are on repeat over at our casa. I love creating simple easy-to-make recipes that are fit for active lifestyles…because let’s be honest. Nobody’s got time for complicated meal preppin…not even this “I cook for my job” food blogger. Some people think we eat all gourmet all.the.time because the images on the site look all fancy and stuff… so I felt like I should deliver this PSA today. Truth be told, I’m an instant pot newbie, sheet pan dinner, and simple skillet lovin kind of gal. Anything to get me out of doing ALL THE DISHES. 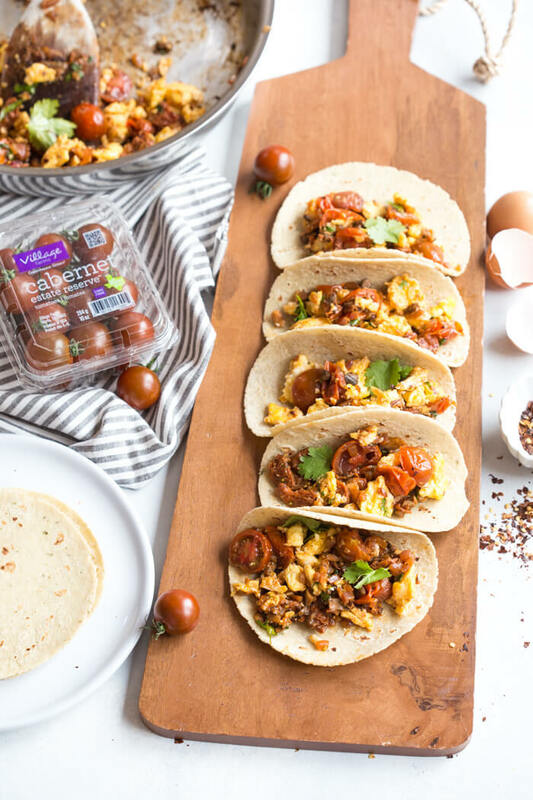 So now you know why I make you things like easy breakfast tacos MADE IN THE SKILLET, because real people like me gotta put breakfast and dinner on the table errr up for grabs too. We eat standing up or on the couch most days. This recipe was developed in partnership with Village Farms who have the most flavorful tomatoes your mouth has ever tasted. Remember those Shrimp and Cherry Tomato Cheesy Cauliflower Grits that you all swooned over last week using their tomatoes?? For reals, get your hands on Village Farms tomatoes ASAP. 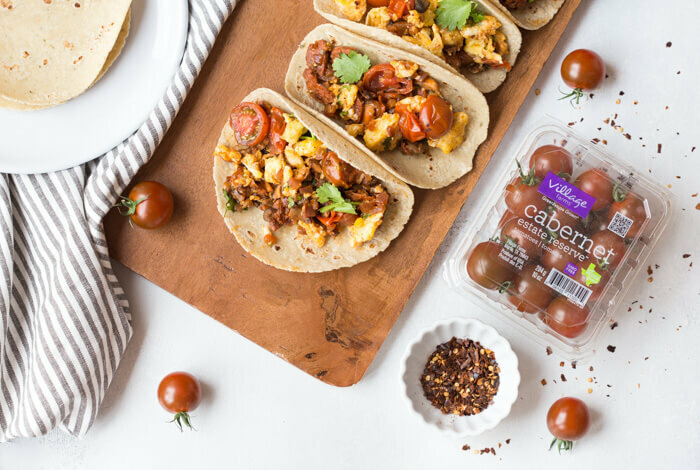 I was inspired to create this Skillet Breakfast Taco recipe with their Cabernet Estate Reserve® Tomatoes because they have this beautiful crimson brown color and taste warm and bold, yet sweet and oh-so-fresh all at the same time. It’s a really fun tomato to eat, especially in a savory breakfast. These tomatoes are more than gorgeous, as their unique crimson brown color contributes beneficial flavonoids that helps with improving blood flow and proper brain function. A cup of cherry tomatoes contains 350mg of potassium; a nutrient important for blood vessel health. Potassium is considered a shortfall nutrient in the diet. In fact, most people are only consuming half of the potassium they need for healthy blood pressure and bone health. And remember tomatoes are even more nutritious when cooked because heat increases their lycopene concentration and makes it easier for the body to absorb … so into the skillet they go. 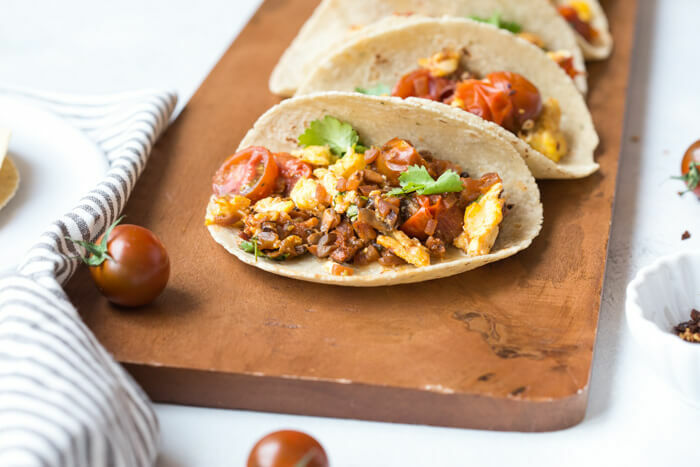 Skillet Breakfast Tacos are one of those brinner (breakfast for dinner) type of recipes… because they are hearty and flavorful enough to eat at the end or beginning of your day. Leftovers, I’m talking about you! If you’re of the meal prepping type and need breakfast in a hurry (who doesn’t?? ), this recipe is for you. Prep the skillet breakfast taco mixture in advance and stuff it in the taco in the morning right before you stuff it in your mouth as you’re running out the door. See what I did there, I’ve made you the ultimate breakfast on the go. 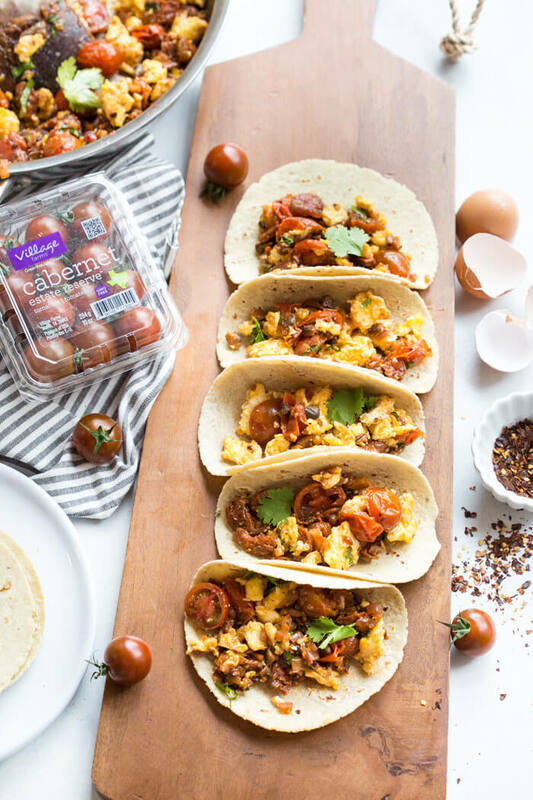 So go ahead and do yourself a favor…get your skillet breakfast taco on! 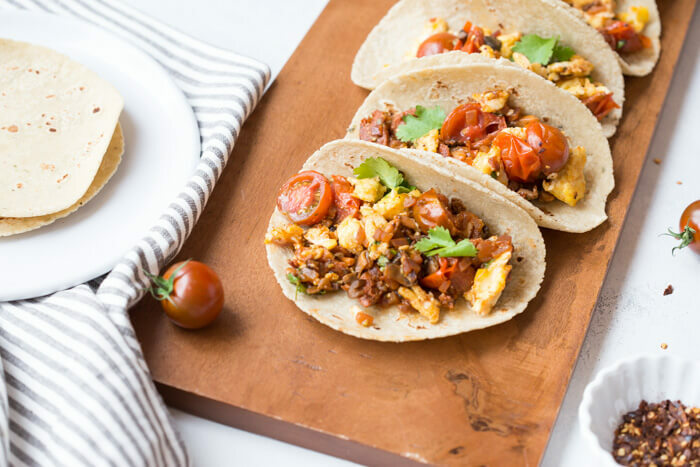 Get excited because these Skillet Breakfast Tacos with Chorizo and Tomatoes are da bomb dot com. Like literally flavor explosion in every bite. This recipe is one of those can’t stop, won’t stop type of breakfast recipes. Seconds? Yes, please! These look amazing! Those tomatoes are like little bites of sunshine!!!! 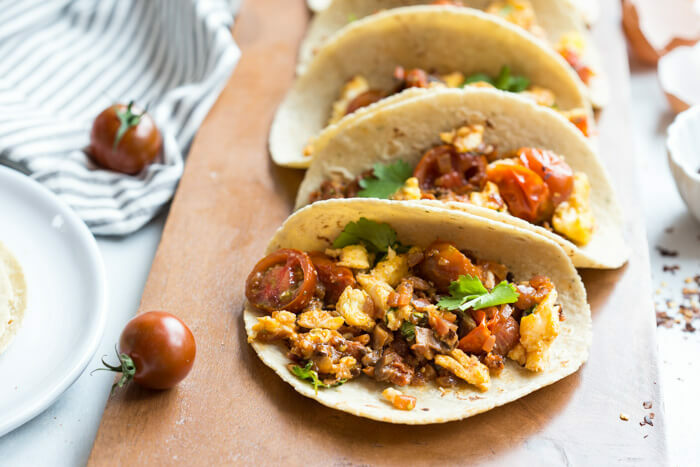 Breakfasts tacos! We haven’t made them in a long time, too long. I’m going to have to make them to switch up and add some fun to breakfast and taco Tuesday!